Fast Forward 2 by Lou Anders, ed. The first thing I’m going to mention about Lou Anders‘ second Fast Forward anthology is the John Picacio cover artwork, which is a real Zeitgeist catch. Below is strife, carnage, religious angst; thrusting upwards is bionic monkey-man, his chains broken asunder, transcending mundane squabbles for the promise of space and rationalism (bubble chamber tracks?). The religious discord is heightened by the DNA motif, explicitly repeated in the exhaust blast of robomonkey… if you wanted to encapsulate the hope for a triumph (or at least secession) of a rational worldview, I think you’d struggle to make a more arresting and vivid image in the process. So, how does Fast Forward 2 match up to this thrusting visual metaphor? I’m going to divide up the stories, somewhat arbitrarily, on the basis of how close the stories fit with Futurismic‘s chosen aesthetic niche of mundane and/or near-future sf – though this should not in any way be taken as a scale of worth, but more as one of local relevance. What I hope will be abundantly plain is how strong I found the selection as a whole. It’s been suggested to me as a rule of thumb that genuinely enjoying half the stories in an anthology is to be considered a sign of a good TOC. If that’s the case then one of three things is true: either I’m too easily pleased, or my tastes coincide very closely with Lou Anders, or Fast Forward 2 is an excellent anthology. There’s not a single story I actively dislike, and even those I’m lukewarm to have obvious merits. So let’s start close to home (in time, if not in space) with Ian McDonald‘s “Eligible Boy”, which is full of the effortlessly believable (and, more importantly, loveable) characters that have put him on the map. McDonald‘s tale is not just plausible (given the single novum of strong artificial intelligences) but as compelling as the soapi shows that share the future India he depicts. I’d love to read more like this; River of Gods was staggeringly good, but the short form lets McDonald roam more freely in search of situations that are closer to everyday life, but which might not prop up an entire novel. “Mitigation” by the potent double-act of Karl Schroeder and former Futurismic staffer Tobias Buckell takes the best of both writers. Buckell‘s instinct for fast-moving action drives the plot, while Schroeder‘s concern with (and deep knowledge of) the impending ecological crisis provides the set and setting for a classic double-bluff. It’s a good balance; the bleakness of the impending future is mitigated by the snappy pace, so you take on board the underlying message without being drowned in it. With “The Gambler“, Paolo Bacigalupi steps out of the niche that has been built around him on two counts – first by writing something so near-future it could be set before the close of the current decade, and second by writing something with a glimmer of hope to it. A plausible enough vision of the future of web-based new media to provoke io9 to cite it as accurate (albeit slightly ironically, considering their recent broadening of remit), “The Gambler” is actually a classic story re-told – the journalist who, despite the disapproval of his superiors, wants to write the news stories that really matter as opposed to puff-pieces. Jack Skillingstead‘s Phildickian “Alone With An Inconvenient Companion” can be read two ways, but I chose to read it as being told from the viewpoint of a delusional schizophrenic; the characterisation is excellent, and the mood of the piece shifts constantly between moody darkness and redemptive light. A beautiful but sad portrait of madness in a mad world. “Molly’s Kids” by Jack McDevitt has an undercurrent that appeals to my mundanity jones – the implication being that perhaps the AI created to pilot an interstellar probe is actually more important than the probe’s mission. That said, the kid inside me who bugged his parents for pretty much anything related to the space race and the Shuttle missions still feels kind of let down that the rug gets pulled out from under the lift-off… no matter how realistic a result it may actually be. The quasi-sentient gen-modded plants of Kay Kenyon‘s “Cyto Couture” may be pushing the bounds of mundanity by some measures, but the setting of Kenyon‘s story is eminently believable. The viewpoint character is a little too goody-goody for my taste, but he’s balanced by the disaffected outsider with an axe to grind, and it’d take a greater cynic than myself to not at least smile at the muted triumph of its conclusion. Likewise tapped out beyond the bounds of mundanity is Nancy Kress‘s “The Kindness of Strangers”, which showcases the sometimes surprising mutual benevolence of human beings when sharing a confusing and – quite literally, in this case – alienating series of events. Kress is well-known for her portrayal of alien races, although here they take a supporting role to the convincingly written humans. This story was slightly soured by the saving-us-from-ourselves ending; the resolution Kress presents is far from an ecological get-out-of-jail-free card, but I’m instinctively leery of any story wherein the human race escapes environmental catastrophe through external intervention. Call it a sign of the times. Kristine Kathryn Rusch gives us “SeniorSource”; I liked the conceit (complex tasks outsourced to the elderly convalescing in zero-G care homes), but the telling was not particularly stunning, and the core plot likewise. In a weaker anthology, however, I suspect I’d have thought much better of it. Now we’re into the long-future stuff. By dint of sheer size alone, the centrepiece of Fast Forward 2 is Cory Doctorow and Benjamin Rosenbaum‘s “True Names”, an implicit homage to Vernor Vinge’s seminal novella of the same title (often credited as being one of the first fictional appearances of a recognisable technological singularity as well as one of the earliest works to have a fully realised ‘cyberspace’ as its setting, three years prior to Gibson’s Neuromancer). No surprise, then, that it’s a crazy bells-and-whistles epic of big ideas that pits three different post-singular societies against each other on a galactic scale. Because of that, it’s sure to be the sort of story you love or hate; fans of Karl Schroeder’s Lady of Mazes, Stross’s Accelerando and some of Doctorow’s own material are going to lap up the multiple iterations of the same characters, the nested and interlocking simulated realities, and the sheer ebullient geekery of the whole thing. I enjoyed “True Names” a great deal, but there’s a case to be made that the flux of characters and situations (and the firehose of ideas) could be hard reading for a reader more accustomed to conventional narratives; it might also have been a little shorter. But considered as an imaginative sensawunda geek-out, “True Names” raises the bar for the subgenre. “Long Eyes” by Jeff Carlson is the tale of a lonely human sentience given a galaxy-spanning ship to pilot after an experiment in machine control using embedded minds goes wrong. Cruising space in search of novelty (and maybe her own redemption), she finds a planet that harbours life – and we get a kind of nested first-contact story. The society that created her, and her contact with the (d)evolved species… her experience with the former feeds into her interactions with the latter. A subtly cautionary tale with plenty of old-school sensawunda. Paul Cornell‘s “Catherine Drew“ is high adventure and espionage in a parallel universe, complete with imperialist shenanigans and skulduggery on Mars, and an ancient artefact of puissant power thrown in for good measure. Not being a great reader of comics nor a fan of the Doctor Who franchise, this is the first fiction of Cornell‘s I’ve read (despite jabbering rubbish at him at numerous conventions in the past few years). I’m looking forward to being able to tell him, quite earnestly, that I really enjoyed it. There’s enough worldbuilding in the background to suggest more stories in the same universe; something to look forward to. “Not Quite Alone In The Dream Quarter” sees the third double-team effort, this time between short story veteran Mike Resnick and cyberpunk high priestess Pat Cadigan. 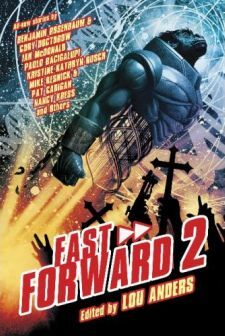 Easily the most unreal and metaphorical story in Fast Forward 2 – a textbook example of slipstream, perhaps – it’s also one of the bleakest, examining our relationship with our dreams by casting them as an alien race. Musical and harrowing, it encouraged as much afterthought (if not more) than the more rigorously speculative pieces. While Picacio’s visual narrative may not precisely match the fictional content of the book, its vividness and sensawunda are echoed all through; if you wanted a good argument for buying anthologies of original short science fiction stories – or even a good defence against those who claim the form is ossified and irrelevant – Fast Forward 2 has your back. The economics of sf magazine publishing may be in question, but the quality of fiction available is riding as high as it has ever been. Sincerely recommended. A very thorough and interesting review. I’ll be stopping at the bookstore on the way home tonight. Thanks! No problem, Dave – I hope you enjoy it as much as I did. Wow. Massive review. And i’m totally going to try and lay my hands on this (and its predecessor) in the post-Christmas loot trawl. While it’s fun to read the Rosenbaum-Doctorow novella while you’re waiting for Amazon to deliver your hardcopy-only version of all the other stories, “True Names” has far more in common with Greg Egan’s “Schild’s Ladder” than it does with Vinge’s story. Both Rosenbaum-Doctorow and Egan involve far-future environments when personalities put on and take off bodies as easily as we put on hats or overcoats, and are concerned with the reaction of protagonists and societies to subatomic plagues that are at first thought to be eating at the foundations of reality, but turn out to be hosts of even more diverse forms of experiencers rather than plagues. In passing, Rosenbaum-Doctorow toy with the limits of simulations of environments recursively hosting multitudes of environments without approaching the real foundational issues in computer science of decidability and unsolvability, while Egan pushes much more forcefully into the the foundations of physics and quantum gravity. If you’re looking for SF that tries to take ideas to their limits, Egan will get you further. Thanks for the input, Jeff! I didn’t use Egan as a touchstone because I thought the others were more likely to resonate with the average reader here, but you’re quite right. I’m hugely fond of Diaspora; Schild’s Ladder was good, too, but didn’t grab me quite the same way for some reason.